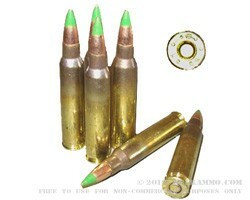 M855 on stripper clips is one of the most popular loads in the world. It’s a consistent seller that gets bought up as fast as it can be restocked. This Federal Lake City premium spec’d out ammunition is about as functional as it gets for the AR platform. Shooters everywhere are all looking for ways to add to their ammo supply by grabbing another case or half case as they come onto the market. The reason? Convenience, reliability, performance, value and history. Convenience comes in the form of the stripper clips, making magazines easy to load both for the ammo that comes on the strips and for ammo in the future that is bought in other formats. The reusable stripper clips offer a fantastic value add. 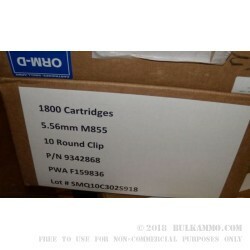 The reliability of the “same as mil-spec” ammo from a proven production facility utilizing all the same components that are shipped to the military is a clear winning formula. Performance is great out of the sweet spot of twist rates offering great accuracy and function out of 1 in 8; 1 in 9 and 1 in 10 rates, with extended usability beyond that. A potent 2800 fps velocity and 1390 ft. lbs. of energy offers excellent cycling and functional performance. The penetrator bullet is an added value. 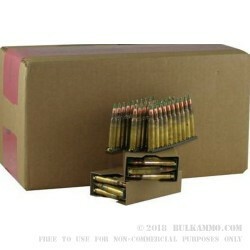 This is a 900 round case of m855 ball ammo.